I started going to the pub 22 years ago and I’ve never really stopped. Other things I’ve done for a long time include supporting Grimsby Town Football Club and listening to indiepop. But I thought indiepop was finished for a few years in the 1990s. And I stopped going to the football for a few years in the 1980s. (Indeed, I feel like I might stop again at any moment.) The pub, though – the pub is the only constant. It has accompanied my every step, on the journey from youth to the cusp of middle age. This week in pubs has been a journey back and forward in time. Back to the places I went 20 years ago and forward to the scenes I might inhabit 20 years hence. It begins inconsequentially on Monday evening at the Rutland Arms (featured here). I make a point of going to the Rutland after band practice, because they announced this morning that Ginger Marble is on tap. This is an irresistibly delicious beer made by the Marble Brewery of Manchester, and it’s not that easy to find. I look up at the chalkboard behind the bar listing the draught beers. No sign of Ginger Marble. I scan the pump clips. Nothing. It’s gone. It’s a good thing the Raw Brewing Company’s Edge pale ale is here to help and delicious enough to help me forget. Time and ageing weave a spell more complex still than fine beer. It’s only as you age that you really notice change. And the world today is full of astonishing things that no-one would have dreamed possible just a few years ago. Some are unquestionably good: mobile broadband internet, (relative) peace in Northern Ireland and vegetarian sausages. Other developments, one feels, may not necessarily be contributing to the progress of humanity: reality TV, call centres, and people younger than 50 openly listening to folk music. So it is, on Thursday night, that my friends Tonieee and Mark knock on my door on their way to the marvellous Princess Royal (pictured above) and ask if I’d like to go with them. There’s a folk night, apparently. I say yes. The music is interesting, sometimes excellent, and the company is welcoming. Tonieee, Mark and I are by no means youthful but we’re the youngest people in the room. Except for one of the performers, Charlie, who has an album on the go and can sing a bit. The banter between Charlie and the audience is sweet but slightly stilted. It has its moments though. “You don’t really want me to do another, do you?” she says, when the audience asks for an encore. There are plenty of worse ways to enter life’s home straight. But it’s back downstairs at the bar, and away from the music, where my finest hour passes. I’ve ordered my pint and I’m ready to pay when the landlady comes over with a big smile and urges me to put my money away. This one’s on us, she explains. Well, I’ve always enjoyed the friendly service at this pub, but this is going a little further than usual. I’m not going to say no, but I can’t help asking why. She points slightly past me, to the wall, decorated with a clipping of the interview about this blog that I gave to the Sheffield Star last month. The part where I praise the Princess Royal is picked out with a highlighter pen. Not that I in any way anticipated or expected this from doing the interview, you understand, but if anyone else would like to give me free beer for writing something, please do feel free to get in touch. Friday night brings a proper work night out – at the Red Deer (pictured above), then at the Rutland Arms again, which is probably busier than I’ve ever known it. I can’t remember ever having to queue for a wee in there before, at any rate. In sorry contrast, Swigs on Saturday night is almost deserted, and certainly the quietest I’ve ever known it at this moment of the week. I’m in Cleethorpes for the weekend with my family. Rather than go out in Cleethorpes, which is quite nice in places, my girlfriend and I catch the bus into Grimsby, where I used to go out when I was 18. Of a Saturday evening Swigs would typically be teeming with all manner of Grimbarian humanity. It was vibrant and compelling, it was loud and alive. Tonight there’s a group of four old folks who smile kindly at us but sit silently in a line instead of round the table talking. And a man sitting on his own. The paint is cracked, and the wood chipped: the only thing unchanged from 1991 is the decor. OK, the decor and the very cheap Willy’s original bitter. The sociable man working the bar does his best to keep our spirits up, but it’s a losing battle. Unloved and utterly forlorn, Swigs is a sad shadow of a pub. It wants doing up or selling off. After that it’s a relief to cross to the Barge (pictured below), the pub that defined me. It’s as alive as it was two decades previously. There used to be rock, metal, punk, grunge, goth and indie on the jukebox and now there are just two genres: Nine Inch Nails, and Stuff That Sounds Like Nine Inch Nails But Isn’t. Other than that, though, it’s a life-affirming thing to be here. The big group of young people on the next table are bellowing things like “STOP FLASHIN’ YER FANNY AT ME!” but I’m now in a mood to smile indulgently rather than tut and mutter. Me and my missus are already guzzling boozes and warming well to the evening when I glimpse my old mucker Julian. Julian was one of the people I knew when I used to drink here all the time, go to parties and gigs, pass out after too much Newcastle Brown and sleep on grotty floors under my massive Echo and the Bunnymen overcoat. He used to do the same thing. We worked together in a record shop for a bit as well in 1995, which was the most fun you can have on three quid an hour. I go over to say hello to Julian, for the first time in about 15 years. “Bloody hell, Pete – you don’t look a day older!” he says. This seems the sort of conversation I enjoy being in, so I buy a pint and carry on talking. We sit back down and one of Julian’s mates brings a tray of shot glasses containing an array of bright liquids: green, yellow, pink, electric blue. “What are they?” asks my girlfriend. What the hell. They smell a bit like Pernod. But on the other hand, they taste revolting, so they’re probably Pernod. The last Julian heard of me, he says, was the other year, when his other mate sent him a link to a Christmas song and told him it was the best Christmas song ever, and it turned out to be mine. However far, however long… we never quite break entirely with the past. I’ll spend the following afternoon taking a last look round my old school before it gets demolished. That’s the planned and scripted way of revisiting the past. The unplanned way – the chance meeting with someone you haven’t seen in 15 years – that’s the better one. Especially because it’s in a pub. Amid the awkwardness of a busy school reunion, I don’t even want to see the people: I’m only there to look around the building. It pales beside the easy camaraderie of the pub – which is all about the people. The pub is the only constant. It’s the most comforting way to enter the future and the only safe passage to the past. 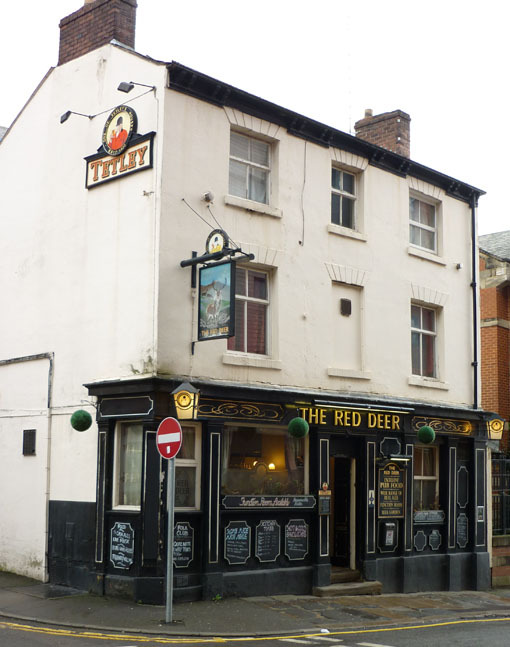 A few of us from the pub are coming over to Sheffield on Saturday 6th Aug for a bit of a real ale pub crawl, it would be great to see you and you can advise us where to go.